The story concerns Horn’s drifting into Wyoming Territory late in his life, already having captured the legendary Geronimo, worked for the Pinkerton’s and established himself as one of the greatest trackers that ever tracked (I know, that sounds weird – like a Looney Toons line). There are plenty of suspicions that Horn was little more than a hired assassin, but these accusations are countered by other claims of his heroism, crediting him as one of the many characters that helped conquer the west and make it suitable for settlement. To me, part of what makes a movie great is that it does such a nice job of presenting the story, I am compelled to look up details on its character(s)! Regardless of who he actually was, the Horn depicted in the film was a guy who couldn’t live without freedom. 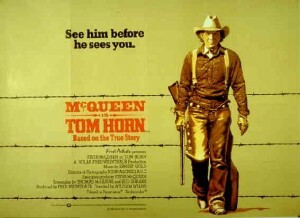 In the opening scenes, Horn has been roaming the countryside. He hits a town to get his fill of whisky and grub, and almost immediately gets into trouble. However, people knew his name: as soon as Horn gets himself beaten to within an inch of his life, a cattleman played by Richard Farnsworth (the quintessential supporting actor) commissions him to help with his rustling troubles. From here, the story takes its time establishing that whatever job you gave Horn, he would carry it out to a T (for Tom, get it? Sorry.) I was terrified and impressed with the explosive violence. 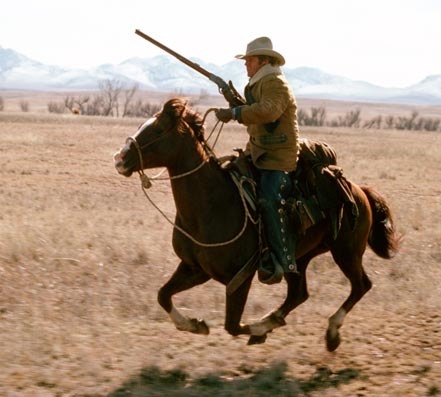 Take, for example, the scene in which a rustler surprises Horn and in the process, shoots the hero’s horse! 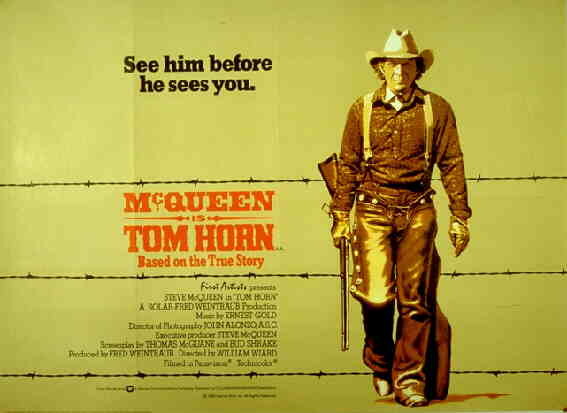 Let me say this: woe be to you if you harm Horn’s horse… The director, William Wiard, does a splendid job of distracting you with the beautiful Wyoming landscapes and screentime to travel distances. Before you know it, Horn has closed in on more rustlers, and a shootout surprises you with what I would call “appropriate violence”. See an upcoming chat on Basic Instinct for more on that subject, dear Reader. For now, just know that the story required violence and it was presented well, without it distracting from the story or theme. The closing “chapters” of the film concern the true story of Horn’s indictment and conviction for the murder of a teenager. I was reminded of The Wild Bunch in the last third of the film, with the themes of aging and our inability to evolve closing in on us. Dare I say that Horn staring out towards the mountains during the trial (which was held under a tent outside to accomodate all the people) reminded me of a cheetah enclosed in the zoo?